Sam Clifford was busking on Grafton Street on a Sunday afternoon. When he was done playing and began packing up his gear, a man who he had never met before approached him and complimented his performance. “He told me I was very good at what I was doing and told me to keep working hard,” says Sam. Not thinking much of it, Sam thanked the man and began to leave. “As I left, he ran up the road after me and asked me to sing with him at a gig he had later,” he says. Sam was with his mother, Catriona, at the time and she asked the man where the concert was on. The man, unsure himself, checked his phone and told Sam and Catriona that he was playing in the prestigious 3 Arena. 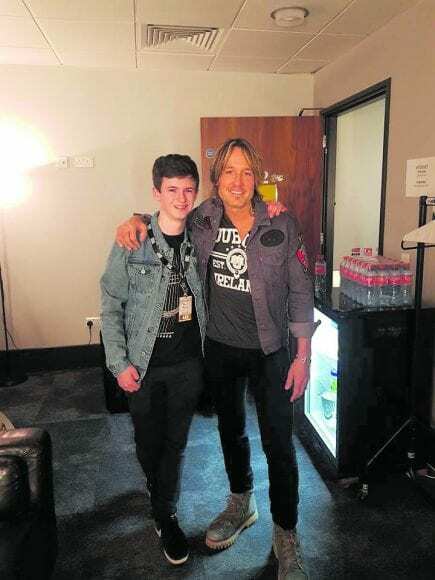 Unknown to Sam and his mother, the pair were talking to country music superstar, Keith Urban. Only a couple of hours later, Sam, a 14-year-old boy from Beach Lawn, Dundrum was singing and playing his guitar in front of 13,000 people. “It was the most amazing experience of my life,” he proclaims. An experience he will probably never forget. Sam started singing when he was only six years old and first picked up guitar when he was 11. “My mother is a singer, but she is the only musical one in my family,” he says. A second year student in Benildus College and a member of the 115th Ballinteer Scouts, Sam gave up playing for Broadford Rovers football club to concentrate on his music. A decision that appears to be paying off. When Sam’s father, Darren, first heard about the chance encounter with the global icon, he was in shock. “I wasn’t with Sam when this all unfolded. Normally I would take Sam busking but, on this occasion, I had to bring my younger son to a birthday party. When my wife rang to tell me what had happened, I thought they were messing with me. It was only later that I realised that they were being serious. “It was all a bit surreal to be honest,” says Darren. Sam admits that he was a little nervous before the performance but says Keith and the band helped ease any pre-gig butterflies. “I was in the dressing room before the gig and we ran through the song and took some photos,” he says.